NASA’s Dawn spacecraft has entered into its final planned orbital position from which it will study the dwarf planet Ceres, the lowest the probe has descended to the tiny world since it arrived in orbit on March 6, 2015. The probe is powered by three xenon ion thrusters and it enter into its new orbit around the dwarf planet on June 6, 2018. Since then, the spacecraft has begun beaming back to Earth stunning new and closer images of this tiny worldlet. 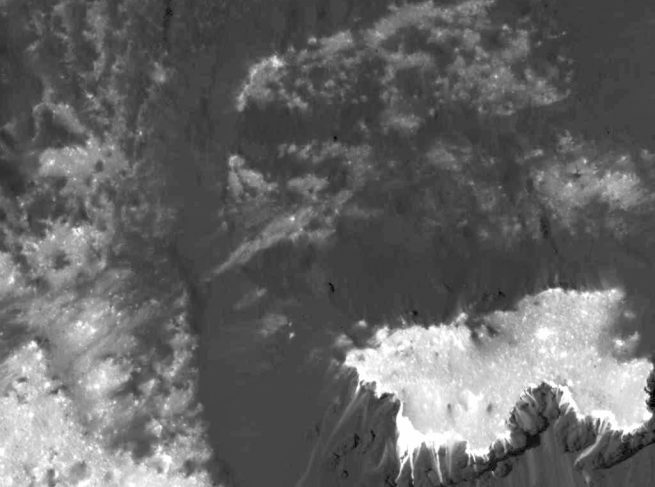 One of Dawn’s targets is Occator Crater. While the name might not ring a bell even among space enthusiasts, the “bright spots” contained within the crater should. These deposits are thought to be salt from briny water that erupted from the dwarf planet’s surface before sublimating. It was found that the bright regions were comprised of sodium carbonate. On Earth, these salts are left behind when water evaporates. Dawn was instructed to fire its ion engine—for what could be the last time—last week. By carrying out this maneuver, the probe flew closer to the dwarf planet’s Cerealia Facula. This is the region of Occator Crater that contains a large deposit of sodium carbonate. Dawn was directed into its last orbit, where it will arc over the tiny planetoid again and again, peering down from an estimated 22 miles (35 kilometers) above the dwarf planet’s surface. It is hoped that the spacecraft’s closer position will bring its features into sharper focus. According to NASA, researchers will employ the spacecraft’s visible and infrared mapping spectrometer as well as other instruments (which include a gamma ray and neutron detector as well as a visible and infrared mapping spectrometer) to study the dwarf planet’s features in greater detail. Before its recent descent, the closest Dawn had traveled to Ceres was 240 miles (385 kilometers). Now more than 200 miles closer in, the differences between the bright and dark regions in the Vinalia Faculae region of the dwarf planet are expected to be more obvious. Dawn was constructed by Orbital Sciences and is operated by JPL, which is located in Pasadena, California. More of the vehicle’s images can be seen here. Rayman is providing updates about the spacecraft’s discoveries in orbit above the dwarf planet, which can be viewed here: Dawn Journal. We need to get some rovers on the Moon and Ceres. Ceres may turn out to be a smart place for extensive mining during the next 100 years. Ceres might also serve as one of many useful future base locations for nuclear powered Space Force spacecraft capable of detecting, intercepting, deflecting, and destroying a NEO headed towards the Home Planet.